The problem is that many Marketers believe that their current traditional Marketing methods are valid because of their current audience. Marketers, your current audience is changing. What we believe about B2B Marketing is changing. Fast. A new report from Think with Google enables us to see this change over the past couple of years. The report debunks four B2B Marketing myths. The reality is that nearly half of all B2B Researchers are Millenials. Millenials are a completely different generation. They have never known a world without the Internet. The report states that “by the time millennials joined the workforce, half of all Americans were using email regularly.” Millenials are digital athletes. Your marketing plan must incorporate how millenials research, buy, and their high expectations of your experience. The reality is that we should not overlook influencers in our marketing strategies. “Everything was being done at the C-suite level, but then we found out that new engineers coming on board were just going online and placing orders.” That is what Caterpillar said about their Marketing efforts to high level executives. While 64% of the C-Suite are responsible for sign-off, 24% of non-execs also have sign-off authority. What is more important than sign-off authority is the collaborative nature of B2B. 70% of B2B transactions include 2 or more people in the decision process. Close to 30% of transactions include more than 5 individuals. Decision influencers are an often overlooked group. 81% of non-executives have a say in purchase decisions. The reality is that 71% of B2B users start with their research with a generic, non-branded search. SEO is way more important then you might understand. 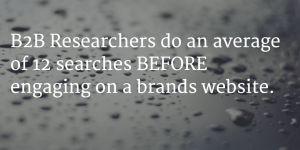 B2B Researchers do an average of 12 searches BEFORE engaging on a brands website. 12!!!! Researchers start with a generic search, and narrow their searches at each stage in their process. Search is the #1 resource for research. PPC and Display Advertising are easy. SEO is hard. Content Marketing is hard. With millenials on the rise, and multiple people involved in a buying process, SEO is critical. Recent trends show that certainly most researchers don’t go beyond the first page, 30% don’t go beyond the FIRST RESULT. Understand how your customers research and buy. What are the broad searches that your customers start with? What do the long tail searches look like? That may be true for transactions. For now. But researching is a completely different story. The reality is that B2B researchers are using Mobile through their entire research path. Again from Think with Google, 42% of researchers use a mobile device during the B2B purchasing process. Of those, there has been an impressive 91% growth in use over the past two years throughout the entire path (instead of just at the initial stages of research). First of all, this is a great report. Millenials, Influencers, SEO and Mobile reflect how our Marketing strategies need to change. We have to address how digital athletes use Google and their Mobile devices to research from broad to narrow searches. You need rich product information and great content. Our content needs to be educational and doesn’t always have to be self-promotional. Understand these four b2b marketing myths and work towards changing your strategy.